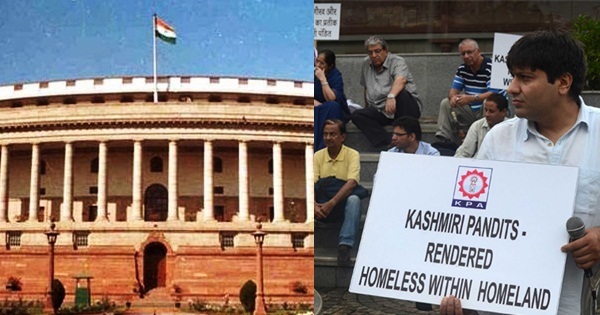 Why India Needs Kashmiri Pandits in its Parliament? My late father in law was very fond of telling me a particular story. It was on why he left Kashmir to come to Delhi and why he stayed back. All fathers have a story they love to tell their children as a legacy and he was no exception. He would give the example of numerous Kashmiri Pandits who rose to prominence being bureaucrats at the center and held the top posts. It was after he had told me the story many times that I asked him when their community was so intelligent and ran the administration why couldn’t they foresee their exodus from Kashmir in 1990? Why couldn’t they see the mechanization of the Kashmiri Muslims coming and had to flee hearing the slogans from the mosques ‘either convert or leave or die’? He became sad and pensive. I realized I had unknowingly hurt him by asking this question. It was then he told me the second story. This one was even more poignant. It told me why he never went back. “We were not a race to fight back,” he replied sadly. In olden times, Brahmins saw themselves as advising the King and telling him how to run the kingdom. They never saw themselves as becoming the King. Was that the attitude, the script that predetermined and guided my father is law’s destiny? The one he was talking about? And was it the reason that Kashmiri Pandits were never political beings, politically conscious race who could fight for their identity, their roots? 1990 changed all that. Overnight it not only uprooted the community but dealt a fatal blow to the very identity and pride of the community. From venerated advice givers and intellectuals, suddenly the community became refugees and had to struggle for survival living in tents and camps surrounded by brick kilns. As a sense of shame pervaded them, they saw their civilizational values crushed to the ground and could never understand why the world remained silent. Once a proud community that had given the world some of its finest works of scholastic excellence, now had to find reasons of daily existence. Through all this, there is one thread that seems to run again and again. It is that the Kashmiri Pandits were not a politically conscious people earlier and had stopped being so for a long period of history. Today, one witnesses a new phenomenon and that is the new Kashmiri Pandit who is a changed man. No longer is he scared and petrified of the murderous attack that drove him out. Every race goes through a moment of truth, of metamorphosis and I believe that has come for the Kashmiri Pandits of the modern India with the changed leadership at the center. In terms of number they may be small, but they have an identity that is glorious and like no other. If we don’t listen to that voice, I believe, we are making a serious mistake and a voice that can be of all Indians one day. That voice is spiritual and comes from the land where Hinduism took its roots and grew to be in its finest glory. I believe the time has come to change that narrative. Today’s India is different from the India of earlier times, even the India of ten years ago. Todays’ Kashmiri Pandit is a changed one, whose collective is rising and who is turning into a political being like never before. It will be a serious loss for us as Indians if we fail to recognize that new consciousness that is emerging. Thirty years of being out of the homeland has brought him out of the survivor mode and he is going for his roots, his identity in a way that is both courageous and I believe, will chart a new path. A politically active and conscious Kashmiri Pandit is a symbol that India has not lost, that Hinduism hasn’t lost and last but not the least our vision is not lost. Politics begins where we become conscious of how and why others are trying to exclude us from the mainstream of the national discourse. Today that is the script of India with many Breaking India forces trying to break our country into pieces. A picture of a Kashmiri Pandit in the Parliament will tell the world that no one can be excluded and pushed towards oblivion and annihilation in modern India, however small he may be or his identity maybe. He is in the majority of one and that is the soul of India. Are these the only reasons why we want Kashmiri Pandits in politics? As a non- Kashmiri and as an Indian, I believe, there is a deeper reason and that is to do with the civilizational values of India. I believe my country has always given a voice to the survivor, to those who have shown resilience to protect those values and have fought to preserve the ancient traditions and culture that makes India what she is. A politically active Kashmiri Pandit leadership will tell the world about not only the resilience of Bharat Varsha and her glory but also give a message to what she stands for. I hope our political parties are listening. A small step has been taken in this direction that promises to take the community on a path of self assertion and identity. If we nurture it today, it will grow into a giant tree which will one day provide support and sustenance that the land of Kashmir once did to the rest of India. This is what we, from the rest of India, owe to the land of Kashmir. The voice of Kashmir rose from the very heart of Srinagar and reverberated across India. It was the voice of sanity, of the highest levels that Indian civilization had reached. The seat of Shankaracharya temple, the oldest temple there, still resonates with bells that had reached the farthest corners of India once. When someone from this city gets up to speak in India’s Parliament, it may not only be said to rise from the very place where the soul of the Indian civilization once stood but will give the world a message of unity for all Indians that will resonate for generations. The Kashmiri Pandit, may not have a large flock behind him today but he is someone who more than what anyone else can tell the world about the rights of India over Kashmir and why it is an inalienable part of India. Featured image courtesy: Indian Defence Review and India Today. Dr. Rajat Mitra is a Clinical Psychologist, Author, Harvard alumni, and UN public service awardee for gender justice, having worked nationally and internationally on human rights issues.